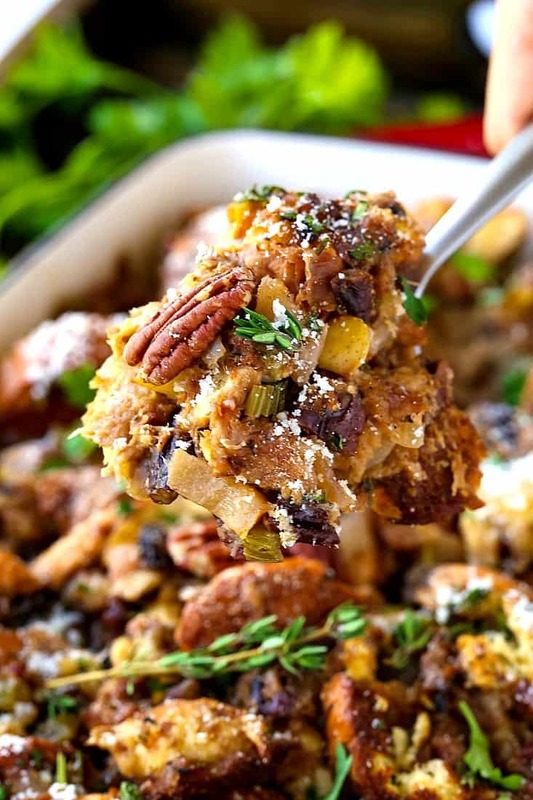 Pecan, Fig and Pear Vegetarian Stuffing has something for everyone! 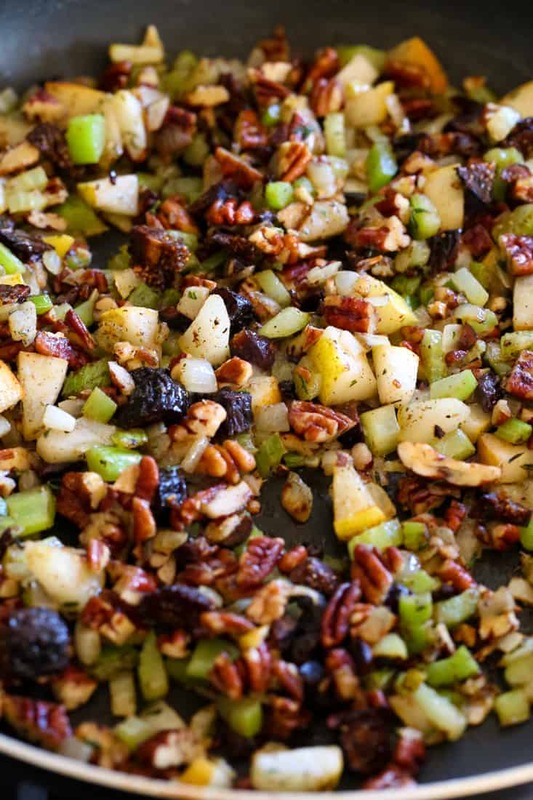 Figs and pears with crunchy pecans flavor this Thanksgiving vegetarian stuffing recipe! We’re on day five of Stuffing Week! 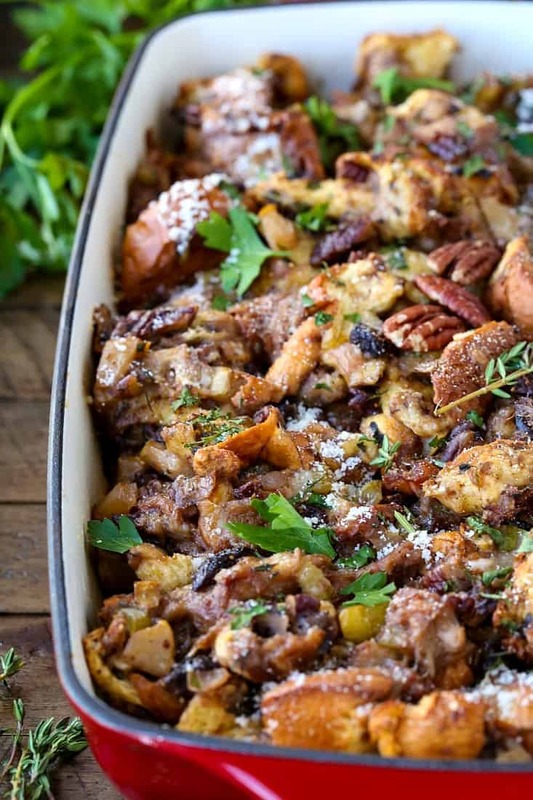 Today we’re bringing you this Pecan, Fig and Pear Vegetarian Stuffing that you’re going to love! 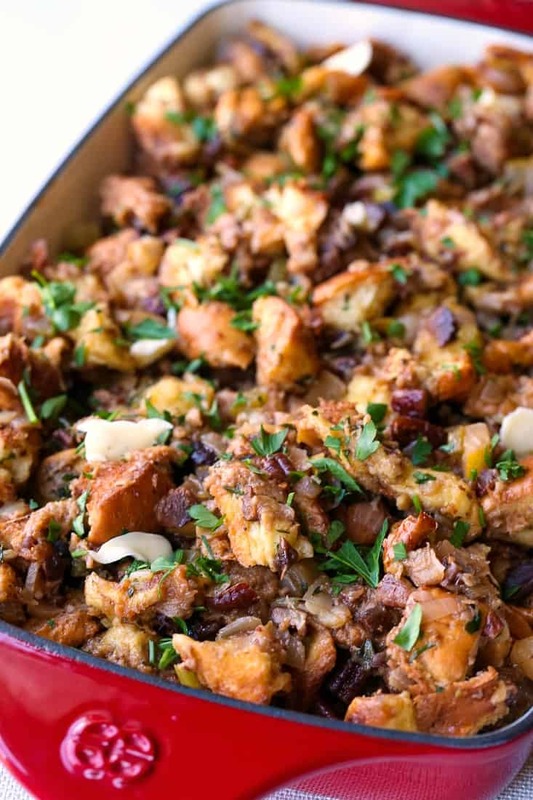 Pecan, Fig and Pear Vegetarian Stuffing is our day 5 stuffing recipe for Stuffing Week! We used our base sausage stuffing recipe, made a few changes and came up with this completely delicious, vegetarian stuffing! We made it! Day 5 of Stuffing Week is here and we wanted to end up with a homemade vegetarian stuffing recipe so there’s something here to please everyone. 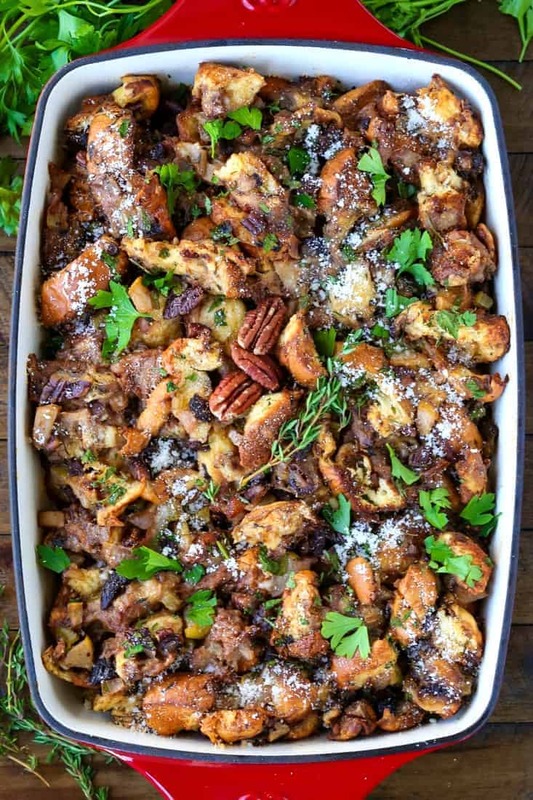 This vegetarian stuffing recipe has crunchy, toasted pecans, dried figs and sweet pears. Tossed together with toasted brioche bread…how can you go wrong with that combo. Talking about all the stuffing recipes here this week have really making our mouths water for Thanksgiving dinner. Besides the big bird, you might be cooking a ham or a lasagna too. Does your family do that? Just make a turkey or cook like three different main courses because one just isn’t enough? My family usually does a turkey and a baked ham, but some years it’s a turkey and a lasagna or some sort of pasta dish. As you might know, we are absolutely a meat eating household. The more sausage I can cram into a recipe the better it is IMO. I know that might not be the best way to look at recipe creation but it’s the way I like it. Christie has made a few vegetarian recipes for meatless Monday, or just because and I always eat them. But follow it up with man, this would be great with some Italian Sausage. Meat and potatoes. That’s what I’m all about. Not to say that my meal choices haven’t expanded A LOT in the last 5 years. I can honestly say that every recipe on this site has been tested and eaten by yours truly. Looking For Vegetarian Side Dish Recipes? We do have a few vegetarian recipes on the site here! And especially if you’re making a main course that’s meat or poultry, you might want to stick with a side dish that’s meat free. And really many, many more. So if that’s what you’re looking for just head to the homepage and search under side dish recipes. Back to this Pecan, Fig and Pear Vegetarian Stuffing though. You can make some adjustments to this recipe really easily. You can swap out the dried figs for dried cranberries or raisins. 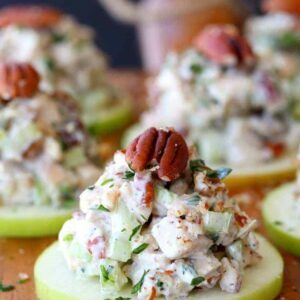 Swap out the pears for granny smith apples, or swap out the pecans for walnuts or almonds. Just follow the base recipe instructions here and make it how you like it! Then place a few pieces of butter on top of the stuffing before it goes into the oven to bake. 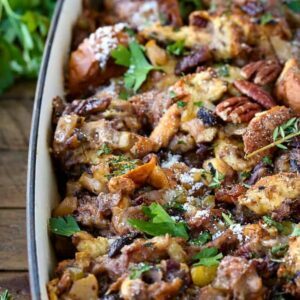 Here’s why this vegetarian stuffing recipe works so well, the brioche is a sweeter bread that I totally love. So it goes really well together with the sweet dried figs and the sweet pears. Now add on the crunchy, toasted pecans and celery so you have some texture going on and it’s a winner stuffing recipe if I ever had one. Looking For More Stuffing Recipes? Well it’s a good this we had stuffing week here, because I have a lot for you to choose from! 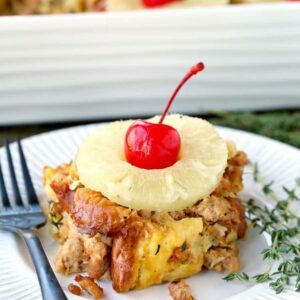 Yes, I think this Pecan, Fig and Pear Vegetarian Stuffing would taste AWESOME with some crumbled sausage in there too. I HAD TO SAY IT. But I promise, if you’re looking for an easy vegetarian stuffing recipe this one is the winner. 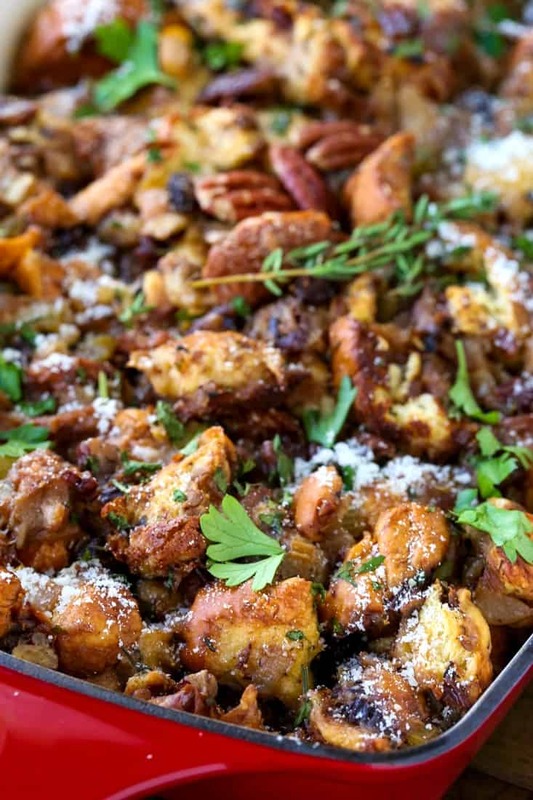 An easy vegetarian stuffing recipe made with pecans, pears and dried figs! Add the butter to a large skillet over medium heat. Once the butter is melted, onions and celery. 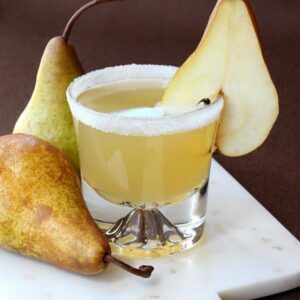 Cook for 5 minutes until they have softened, then add the chopped pears. Cook for another 3-4 minutes, then add the poultry seasoning, salt, pepper, thyme and parsley. Stir in the dried figs, then pour in the vegetable broth. Bring to a simmer then cook for 15 minutes over low heat. Remove the skillet from the heat and let cool for 5 minutes. Place the brioche pieces into a large bowl then pour the vegetable broth mixture on top. Stir gently to combine. Mix the beaten eggs together with the cream and add to the stuffing bowl, then Stir. Garnish with fresh chopped parsley and grated parmesan cheese.